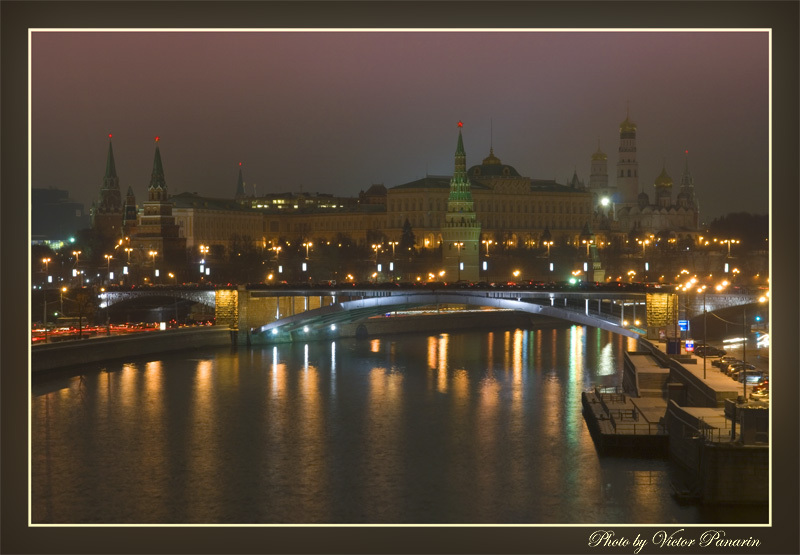 Photo "Night Moscow. On merge of two rivers"
Sight at the Kremlin from the Patriarchal bridge. Probably, someone does not know, but in this picture, except for everything, that we see, there is a place of a confluence of ancient small river Neglinki which has historically appeared under the ground. This place is visible behind the bridge in the form of a stone arch in a coastal parapet. Very nicely presented shot of the Kremlin. The ambient lighting from all it&#180;s various sources is great, and I particularly like your focal arrangement. Nice depth of field also. отлично! звёздочки на крелях ярко горят... Может чёрному лучше было выделить чуть больше места? Да где ж этого черного набрать то, если Москва вся в огнях? Конечно, Виктория. Можно. Но это уже другой снимок с другой атмосферой в которой отсутствует туманность. Ваш вариант по своему хороший. Попробую поработать дополнительно. Возможно, что-то среднее будет оптимальным. Спасибо!